Transform your nutrition and your body by using your favorite protein powder in ways you never thought possible. No matter if your goal is to shed fat, tone up, or get stronger, your nutrition plays a key role in finding fitness success. If you’ve heard the saying “abs are made in the kitchen” you know what I’m talking about! Giving your body the right nutrition and the right foods is crucial. If you think that means eating nothingbut broccoli, brown rice, and chicken or chugging chalky protein shakes, you’re wrong! Loving how you reach your goals is just as important as loving the results. That’s why I put this recipe book together. With 101 tasty recipes you can use your protein powder to make cookies, shakes, muffins, pancakes, and more. By incorporating these treats into your nutrition routine you can achieve your goals deliciously! When you want to burn fat, get toned, or increase your fitness level you need to support lean, toned muscle. Lean muscle helps you burn more calories, look slimmer, and be stronger. But it’s not all about hitting the gym. As an active woman you need about 1 gram of protein per pound of body weight! This protein will help you burn more calories, feel fuller, and support your lean muscle mass. But if you’re just relying on chicken and steak for your protein you’ll wind up with a sore jaw and a boring meal plan. With the 101 protein packed recipes in my cookbook you’ll be able to enjoy treats while still meeting your protein goals. My favorite meal of the day is when I get to enjoy a bedtime protein treat like a dirt cup or mug cake. Not only is it tasty, I know it’s what I need to get the body I want. And it’s all thanks to protein! I have loved every recipe I have tried from this book. I've tried a lot too. I have kept myself on a strict "diet" but I don't feel like i'm dieting with these recipes. This book is worth every penny. I just wish they had an option for an actual book. I hate Ebooks. The hardest thing for me to follow is nutrition. After completing the 15 day challenge I had some kind of idea as to what to eat and portion size but the hardest part was figuring out different recipes, that’s where this book comes in. 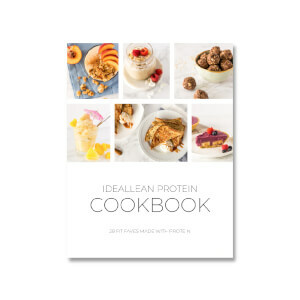 This book gives you delicious recipes that you can follow throughout your fitness goals that tells you the calorie intake and all your macros, its that easy. The best part is it’s not you’re boring every day salad or protein shakes, she gives you different recipes on how to use the ideal fit protein and honestly you won’t feel deprived or bored. You need this I promise you won’t regret it!! I love all the new ideas in the recipe book! I haven't tried everything but so far it's all good!! I struggle satisfying my sweet tooth, but with this book I am able to do it and not feel guilty! I made the better crisp and it was so delicious! Can't beat healthy and great tasting options for breakfast, smoothies, snacks, and much more! I really enjoyed ,the challenge also the protein shake ,I really didn't like the protein bars,but every thing was great, didn't get my meal plan, but I look and see what others was using on Facebook and go with my i dears. Thanks and I didn't recommend other . It is really hard to come up with creative ways to eat all the protein your body needs. I love these recipes! i love this book. I have tried many of the recipes and found a way to make them fit in my macros! thanks Lindsey and team. I am by far in love with these recipes. Rather than trying to eat out or come up with crazy recipies, this puts everything at ease. I have never been able to cook such healthy and yummy food. My family has not complained about dinner lately!